This page lists all reports that for Iceland only that do not involve other countries. 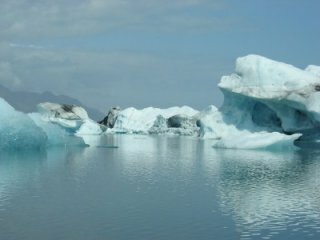 Click here for a list of all reports involving Iceland. A full account of a 10 day cycle tour through the highlands of Iceland completed late August 2013. This was a self supported tour of three friends, two of whom had never done a cycle tour before. Our route started in Hvolsvollur, passed through Landmannalaugar, up F26 past the Nyidalur hut and on to Laugafell finishing in Akureyri. I've included lots of pictures and descriptions of road conditions as well as a detailed account of our gear and food. Enjoy! 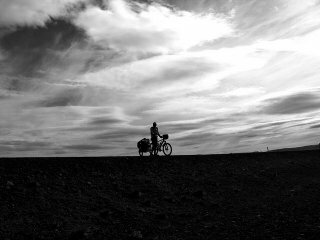 A film documenting a month-long bike tour round Iceland. A film I made to document a 26 day clockwise tour of Iceland. Also includes pages with my equipment list, route map, useful Iceland touring tips and lots of photos. If you want to see an earth that is both fragile and powerful, exposed and isolated, there are few places better to visit than Iceland. Pictures and watercolours from a cycling-around-Iceland adventure. We cycled from Keflavík, visited the 196 m high waterfall Glymur, rounded Snæfellsnes, or we actually took the mountainroad over Snæfellsjökull. At Myvatn we looked at the active area. Along the southcoast we saw Jökulsárlón, Skaftafell, Dyrhólaey, Skogafoss, Seljalandsfoss, Strokkur, Gullfoss and Þingvallavatn. Also see my Iceland-right-now page with webcams and their position on a map. And join my icq user list for Iceland. This is a diary style description of a Swedish cyclist's tour on north Iceland, essentially from Seydisfjördur to Ísafjördur. The aim was to go to several places along the north coast. Therefore smaller roads with little traffic were used to a large extent. The big and busy road no 1 (Hringvegurinn) was used more as a quick transport section between northeast and northwest Iceland. [I] cycled to Hverarönd sulphuric mud pools (solfataras). The ground is unstable there and you cannot walk everywhere. Blue-gray mud is boiling and produces small or big (depending on water content) bubbles that burst. The ground is yellow and reddish and the noise from an abandoned hot water well is penetrating. The smell of sulphuric dioxide is everywhere. After several tours of varying lengths in the UK and France I wanted to do something harder and further afield. A long time ago I read a book entitled ``Running Blind'' by Desmond Bagley which was set in Iceland and impressed me with it's description of the wild and dramatic landscape. 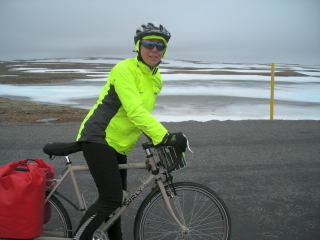 Shortly after starting cycle touring I read ``The Wind in my Wheels'' by Josie Dew in which she spent several weeks in Iceland as part of a longer Scandinavian tour. [...] I chose to go in July as by then most of the interior tracks are open and it is supposed to have the most reliable weather. Includes a diary, maps, photographs, packing list, etc. A couple of years ago I went to Iceland (with my family) by car, I always wanted to go back but instead of a car with a bike. A bike-trip through Iceland. For a few years, that idea, was only a kind of a dream. But time is running. I started to make a bike-trip from Holland to Norway. Besides the bad weather (wind, pretty cold days) I enjoyed the trip. Actually I didn't get any punctures. Perhaps that's the experience I'm looking for (guess not). So I finally decide to go to Iceland. It's a journey that asks some preparations. I'm not going on my own. I couldn't get my friends as stupid, so I'm traveling with my sister, Dagmar (28). I'm 23. Both persons are studying at the university of Groningen. We had to cross about three big rivers (big in the sense that you had to take your shoes off) and a lot of small ones. The first river is fun, when you are biking on Iceland you want to face a river that you have to cross (without a bridge) the second one is ok too, but when you just dried your feet and think that this was the last river and you see another one, you (at least I) wish that I was somewhere in the Jamaica sitting in the sun on a beach with a glass of beer. We wanted to do something off the beaten track. After having met in the US on a cycling trip, Steve and I had always planned to spend another cycling holiday together. Certainly not an organized one and Iceland was only one possible destination (where can you go to if you have only got two weeks?). Has some beautiful photos of Icelands, great maps and descriptions of hiking trips and bicycle tours, and plenty of excellent information - a must-see if you plan to visit the country. First the easy part: why Iceland? Because it's a country with magnificent, raw, bizarre and fascinating landscapes, unique in Europe and probably the world. A place where you can see scenery that makes you wonder what nature had in mind when it was created. But why cycling? I don't think it's the ideal way to move around in Iceland. You are less limited and vulnerable with a 4-wheel Drive. You can cover longer distances and stay drier in a bus. And you're closer to nature on foot. The first reason for me to go cycling is, that this way of transport gives a good balance between money and freedom. Renting a car costs loads of money, and you keep a distant feeling with the environment. The bus or walking limits you to the places where you can stop or go. But I have to admit, that on every cycling holiday, I also used the bus to cover long distances. And I always had some hiking days. I even did an organized one-day trip on my last vacation. You just pick the best way of transport for your goal : to see Iceland. and there will always be wind!